Shakyamuni, the historical Buddha of our present era, is depicted here seated in vajra-posture upon his lion throne. 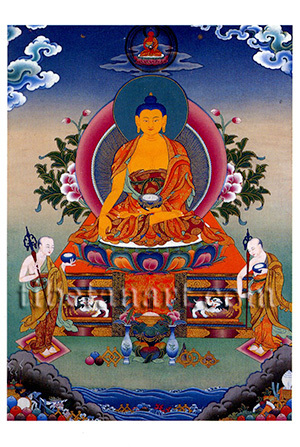 His left hand rests upon his lap in the gesture of meditation upon emptiness (wisdom), as he holds a blue alms-bowl (renunciation). And his right hand reaches down in earth-witness gesture, which symbolises his skilful means or compassion (method). To his lower left and right are his two main disciples, Maudgalyayana and Sariputra, who each stand upon mats wearing the three red robes of a Buddhist monk as they hold the attributes of a blue alms-bowl and an iron mendicants staff.